In a ceremony televised on Fox News and the Food Network, the New Yorker’s “roving food correspondent” Helen Rosner was awarded the 2018 “I Was Told by AppleCare” prize for Unapologetic Whiteness. There are plenty of other ways to achieve crispy chicken skin. But this one is better. I happen to care, above all else, about achieving a shatteringly crispy skin, which means that I need to get rid of as much water from my chicken skin as possible. 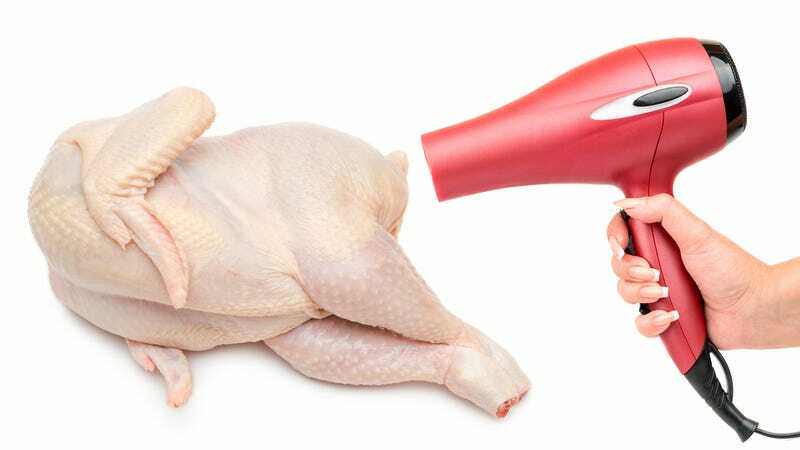 Which is why my roast chicken recipe, naturally, involves a hair dryer. I don’t even know what that means. If you gave me 1,028,393 guesses at ways to unmoisturize a chicken, first I’d ask you what strain of weed you were smoking. Then I’d ask you how much it cost and where you purchased it from. But after exhausting myself of marijuana-related queries, I still wouldn’t guess that a hair dryer was involved in your yardbird shenanigans. Perhaps this is why white people’s chicken tastes like an Excel spreadsheet. Maybe they consider oxygen an “unsalted seasoning.” I’ve read, perhaps it was in the New Yorker, that “happiness is the spice of life.” Maybe wypipo season their chicken with joy. But the whiteness comes not only from the recipe or the fact that she uses a hair dryer: Even though I can’t comprehend the caucasity of thinking, as she puts it—“A hair dryer is less cumbersome and perfect for getting the hard-to-reach moist spots inside the cavity, and in the damp little chicken armpits where the wings and legs meet the body”—I can grasp the concept. Rather, it is which hair dryer she uses that blows my mind: Rosner uses the Dyson Supersonic Hair Dryer, which can be purchased for the low retail price of $399.99. “The Dyson is faster and gentler,” she says, which explains everything. I have always wondered why people treat dead birds so callously and ungently before they stick them in the oven. Presented by last year’s winner, Ashleeeeeeee K. Thomas, Rosner accepted her award by thanking the people who made this all possible, including her family, her friends and everyone who refused to tell her that her chicken tasted like a piece of whole wheat toast covered with a thin layer of Pantene shampoo and conditioner. When asked where she would display her award, Rosner said that she planned to grind it up and use it as an unsalted seasoning.